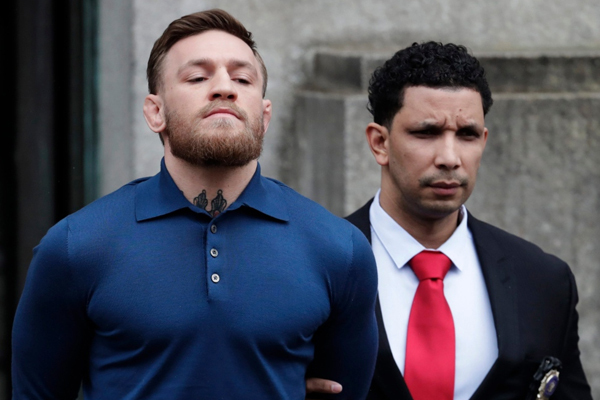 UFC fighter Conor McGregor has been charged with three counts of misdemeanor assault and one count of felony criminal mischief for his role in an incident at the Barclays Center on Thursday. McGregor surrendered to police after attacking a bus full of UFC fighters and employees, shattering a window and causing injuries to those on board. Video footage appears to show him throwing a hand truck and trash cans at the bus during his unannounced appearance in New York. The incident left two fighters unable to compete Saturday night for UFC 223. The promotion canceled those fights, along with a third bout involving Artem Lobov, who is said to have participated in the fracas. Cian Cowley, another UFC fighter, was also charged with assault and criminal mischief. Just this week Dana White said that McGregor would fight again for UFC this year, but now his actions may have put any future fights in doubt.